The Appenzeller originated as an all-around farm dog breed, who stayed busy herding the livestock, guarding the farm, and pulling carts in his native Switzerland. Today’s Appenzellers have still got the energy, smarts, and self-confidence that makes for valuable working dogs — but they’re anything but low-maintenance. Dogs of this breed need lots of exercise, training, and a job to do. 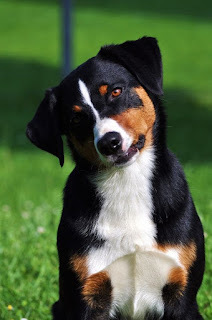 Also known as the Appenzeller Mountain Dog and Appenzell Cattle Dog, the Appenzeller Sennenhunde is the rarest of the four ancient Swiss mountain dog breeds. The breed gets its name from the Swiss herders known as the Senn and Appenzell region of the Swiss Alps to which this breed is native. 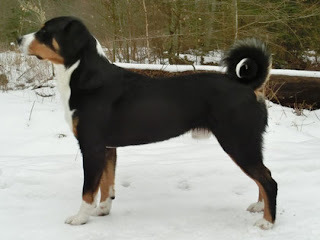 Like its cousins the Entlebucher, the Greater Swiss Mountain Dog and the Bernese Mountain Dog, the Appenzeller is a well-muscled and powerfully built dog. Although a medium-sized dog, it is extremely strong and is capable of pulling small carts and trolleys and working as an all-purpose farm dog. 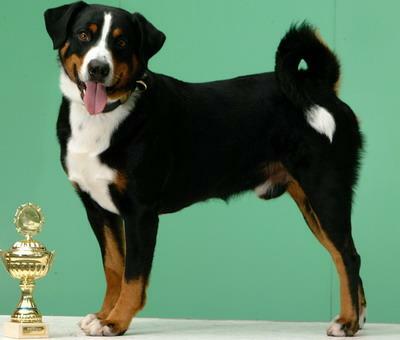 Appenzeller’s have a thick double-coat that is black, brown and white in color and its ears are high set and floppy. Appenzellers are an extremely hard working breed and require a great deal of physical and mental exercise to remain happy and healthy. Although an excellent herder and guarder of livestock, their high maintenance and high exercise requirements have not made them overly popular in the United States. The Appenzeller Sennenhund is descended from the general Sennenhund type which may have existed in antiquity, or descended from "cattle dogs left there by the Romans", but the first breed club for the breed was founded and the stud book for the breed started in 1906 by Albert Heim and others, who wrote the first breed standard in 1916. An early reference to the breed's predecessors was made in an 1853 book, "Tierleben der Alpenwelt" (Animal Life in the Alps), referring to dogs in the Appenzell region. The Appenzeller Sennenhund was only recognised internationally as a separate breed in 1989. The Appenzeller Sennenhund was originally kept primarily as a cattle herding dog, and a flock guardian. It was also used as a draft dog, and general farm dog. The breed also was known for its affinity to both herd and guard with such devotion that they would give their life to protect their charge. Today the breed is primarily kept as a companion, and excels in agility/flyball competitions, obedience competitions and Schutzhund. They are also still used in many places as working cattle dogs even now. They are highly intelligent, and learn quickly. 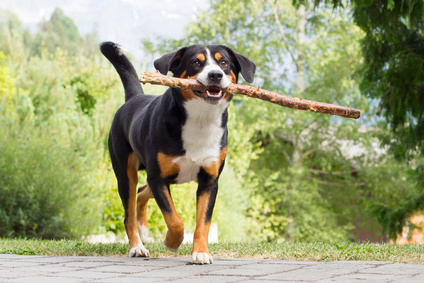 The Appenzeller's working roots are still very obvious in today's dogs. 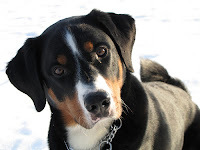 Appenzeller Mountain Dogs are exuberant, willful, playful, intelligent and loyal. While they are wary of strangers, they are very affectionate with their families and make excellent guard dogs and family dogs. The Appenzeller is an extremely healthy breed of dog with little to no hereditary health issues. This is quite rare for a breed of this size. Appenzellers are an extremely intelligent breed and can learn new tasks quickly. However, they are also capable of independent thinking and require owners that can demonstrate loving but firm leadership, consistently. If an owner is meek or unsure, these dogs can quickly assume the role of the pack leader and start trying to dictate terms. This can be dangerous considering the dog’s size and strength. For this reason, Appenzellers are not recommended as a dog breed for first-time owners. Appenzellers were bred to work hard throughout the day, and ensuring that they have enough physical and mental exercise is an important aspect of being a responsible Appenzeller owner. Like all working dogs, Appenzellers too require a ‘meaningful’ task that they can apply themselves to each day. When denied of such a job, they can often turn moody and neurotic and can develop various undesirable behaviors. Appenzeller Sennenhunds are a generally low-maintenance breed. They do not require professional grooming, only a regular brushing. Other than that, only those routine maintenance procedures that every breed needs, such as nail clipping and teeth brushing, are necessary. Appenzeller Sennenhunds do shed, and they can shed very, very heavily. This shedding is usually worst when the seasons change and the dog changes coats. Regular brushing will help reduce shedding, but this breed is still more than capable of covering clothes, furniture, and carpets with hair. If you love the great outdoors, enjoy physical activities like hiking, jogging and long games of fetch, and have previous experience with herding dogs, then the Appenzeller could be the perfect dog for you. These dogs are still rare in the States, so if you want your loyal companion to stand out from the crowd, bring an Appenzeller Mountain Dog home today.